Once again I was asked to get involved when a customer had problems with an application. I won’t go into application or problem details here but the process eventually involved capturing traffic on a customer laptop to see what was actually happening. I expected to see a nice capture of the laptop’s IP communication, but instead I got only one-way communication of client (192.168.8.100) to server (10.192.10.55), and the rest was some weird 802.11 radio-related stuff (as I saw it), as the laptop was WiFi-connected. I even asked the consultant if the capture file surely included all the two-way communication and he said that there is everything included. In the packet flow the frame #16 should be the TCP SYN-ACK response from the server, but as you see there was no IP (or TCP) header shown at all, there was just “IEEE 802.11 QoS Data” and 48 bytes of plain unidentified data. I tried using Decode As function in Wireshark to get it to understand the protocol stack but I couldn’t get any results that way. When compared to frame #16 the four first layers were the same: the frame information summary, NetMon header, 802.11 radio information and IEEE 802.11 frame. But in #16 they were followed by just data, while #15 had LLC (Logical-Link Control). In #15 the LLC header contained the first “magic bytes” AA AA 03 (see Subnetwork Access Protocol for example) and it was located right after the “IEEE 802.11 Data” field. 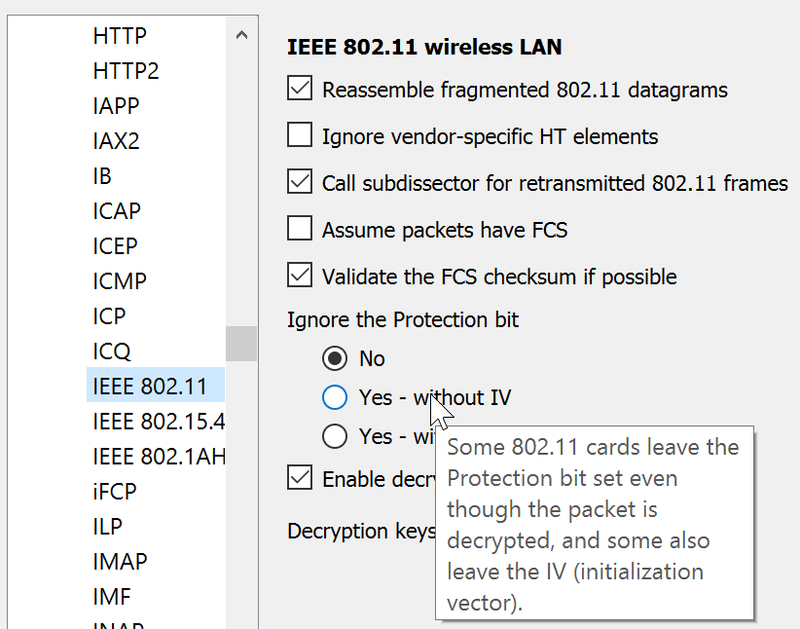 In #16 however Wireshark showed that between “IEEE 802.11 QoS Data” and “Data (48 bytes)” there were four bytes “AA AA 03 00” in a kind of no man’s land. Those bytes clearly belonged to the LLC field but for some reason Wireshark just skipped them, and as the result the rest of the data was not in any kind of sync anymore. Furthermore, I was able to find the relevant IP addresses in the hex data, so there it all was, but the decoding was not catching the data correctly. The extra bit set in my case was Protected flag. All the IP and TCP headers were there correctly. So yes, the consultant was correct, the capture file really included all the data we wanted. With this corrected environment I could continue with the troubleshooting, and in the capture file I actually found an important lead for hopefully resolving the case. At the time of writing this I believe a major software vendor is still trying to find out how their product should actually be configured to work expectedly. Thank you, this was useful. Wireshark has too many options to know them all.